About the library: My library is my comfort zone, holding books and objects that give me good feelings. Most of the books are focused on what it is to be human – psychologically and spiritually. I particularly like the information developed by Carl Jung and Joseph Campbell about symbols in culture, religions, and dreams. My fiction is fantasy and science fiction. About the library: We are just starting to put our library together. 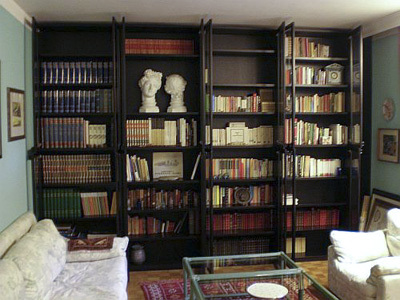 These are eight of the nine bookcases we currently have. At this time most of our books are children’s or religious. It is a work in progress organizing them. 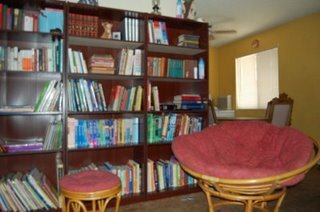 About the library: Here is my little library. It is housed in a old Victorian book case given to me by my mother, also an avid reader of various literature. I love Australian, British and American literature but also occasionally read some popular fiction. 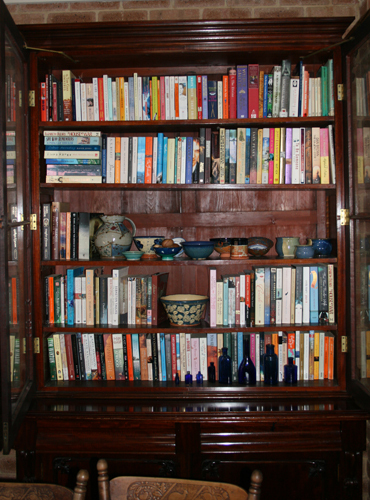 I gradually move the pottery collected around the world, as I add more books.